The GranCabrio, the first four-seater convertible in the history of Maserati, makes its international debut at the Frankfurt International Auto Show. The GranCabrio, the third prong of the Trident, completes Maserati’s product line-up that now consists of three different families of models: Quattroporte, GranTurismo and GranCabrio sedan, coupe and convertible. The GranCabrio continues in the footsteps of the Maserati tradition in open-top models, and adds to a line-up of models that has made the history of the Modena manufacturer, such as the 1950 A6G Frua Spyder, the 3500GT Vignale Spyder (1960), the Mistral Spyder (1964), the Ghibli Spyder (1968) and the 2001 Spyder, the car Maserati chose for his comeback to the United States. The Maserati GranCabrio is powered by a 4.7 litre V8 engine paired with the fluid 6-speed automatic transmission. In Sport mode, the V8 gives the driver and passengers the full power of its 323kW, with a thrilling roar that becomes even more exciting with the top down, as it becomes one with its surroundings. The body of the Maserati GranCabrio has been thoroughly overhauled. Despite the lack of an overhead frame and a wheelbase at the top of its class (2.942mm: longer than its direct competitors) it guarantees the best possible performance in terms of structural rigidity. This enhances the smooth handling, safety and comfort of the car, and fully exploits the powerful, efficient mechanics. The newly-designed bearing monocoque has been made using materials and technologies designed especially to optimise weight: the bonnet and cross beams are made from aluminium, while the boot is made from SMC (Sheet Molding Compound). The excellent weight distribution (with higher load at the rear) also facilitates excellent on-the-road dynamics and improved safety, in combination with the vehicle’s control systems. These include, for the first time ever, the Hydraulic Brake Assist (HBA), which optimises brake performance both in frequent use and in emergency situations. The new body took thousands of hours of calculations, testing and development. The result of all this work is a static rigidity at the top of its class (75000 DaN/m/rad) and dynamic torsional frequency of 27.2 Hz. Particular attention has been paid to developing the aerodynamics, with the creation of a flat aluminium base that not only adds to the overall body’s rigidity but also reduces Cx by 6 points. In this way, for the first time, the convertible version of a car is able to maintain the same aerodynamic performance of the coupe, with a Cx of 0.35. Behind the wheel of the Maserati GranCabrio, driving fun combines with comfort and safety in all road conditions. With the longest wheelbase in its segment, the Maserati GranCabrio gives all passengers an extremely comfortable ride even on long journeys. Their safety is enhanced thanks to the extendable roll bars behind the rear seats, which are activated if necessary. Passenger comfort onboard the Maserati GranCabrio also comes from the perfect integration between the vehicle’s top and its main systems, guaranteeing maximum efficiency and drivability in all conditions. The automatic dual-zone climate control function optimises the conditions inside the car, adjusting the internal temperature and the intensity of ventilation depending on the outside temperature, heat of the sun, and air humidity. By capitalising on the close collaboration between Maserati engineers and BOSE technicians on the GranTurismo, the GranCabrio has been equipped with a BOSE audio system that adds another dimension to open-air music. The Maserati GranCabrio is fitted with Skyhook suspension as standard. The braking system uses high performance dual-cast technology, developed in collaboration with Brembo and already successfully employed on the GranTurismo and Quattroporte. 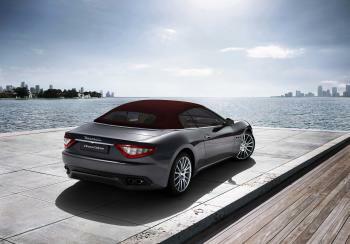 The GranCabrio’s roof is strictly canvas-made, emphasising the link with the Maserati tradition. Aerodynamic, aero-acoustic efficiency and the desire to make the GranCabrio a car suitable for all year driving are the principles which led the Maserati technicians to develop a three-layer canvas hood. Not only does it offer ample opportunities for customisation, but it also adds considerable benefits in terms of on-the-road dynamics, as the car’s centre of gravity is lower. In 28 seconds, passengers can enjoy the thrill of the open-air experience, activating the open/close mechanism even when the car is moving, at speeds of up to 30km/h. Clients and supporters of the brand can already choose contents and features of their own Maserati GranCabrio, thanks to a completely renewed car configurator (configurator.maserati.com/grancabrio/), which is state of the art in terms of image quality and flexibility of usage. 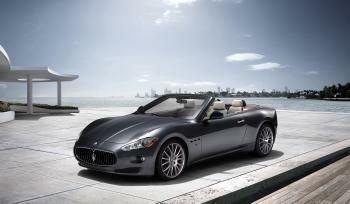 The Maserati GranCabrio is also on the web with a dedicated minisite (maseratigrancabrio.com).